Kanonkop Guest House is set in the private indigenous Knysna forest, home to a variety of bird life including the elusive Knysna Loerie and shy gentle bush buck. Owned and run by the Conyers family, Mark, Samantha and Chris go above and beyond to ensure a relaxing and memorable vacation for every one of their guests. Located on the beautiful Garden Route, Knysna is the perfect base for exploration of all the region has to offer. Guests can take day trips to visit ostrich farms and the Cango Caves in Oudtshoorn or go whale watching in Plettenberg Bay. If you fancy riding on elephants, walking wild cats or jumping from the world’s highest bungee jump platform or swinging through a lush tree canopy, then a visit to Tsitsikamma is a must. There are also a number of walking trails, mountain bike and forest trails to explore right on Kanonkop’s doorstep. Knysna’s pretty town centre has numerous sidewalk cafés and restaurants, gorgeous beaches and the opportunity to get in a little retail therapy. It goes without saying that a tour (by boat or on guided walking tours) of the lush Knysna heads is a must. 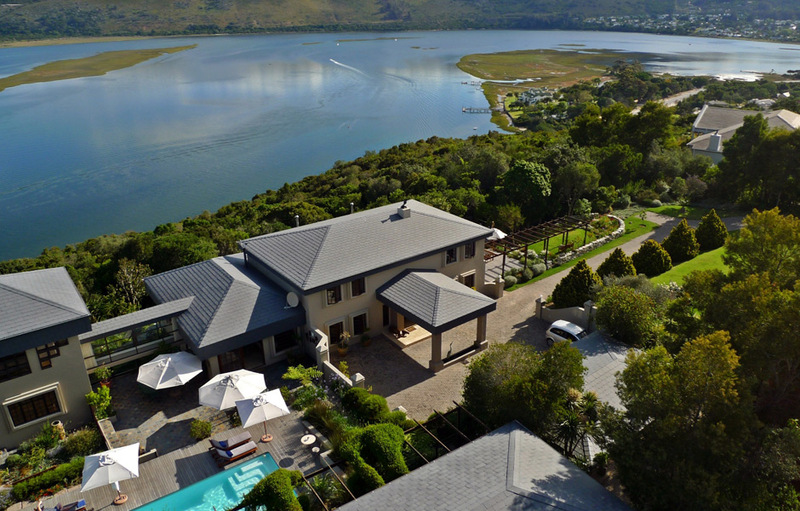 Set alongside the Conyers’ family home, Kanonkop sports breathtaking views of the Knysna saltwater lagoon all the way to the Knysna Heads. This five-star guest house is known for its stylish interiors and superior service. Each of the five bedrooms in the guest house was designed by an award-winning South Africa designer and Frommer’s South Africa Travel Guide listed the Paradise room as the “best room in Knysna. All rooms are non-smoking. Kanonkop House and the Knysna Heights Villa have wireless internet connectivity and electricity voltage throughout is 220V. There are few rooms in the world which have views quite as spectacular as the Paradise Suite at the Kanonkop Guest House. The room is tastefully decorated in calming beach-sand hues and the large windows and sliding doors open out onto magnificent panoramic views of the city of Knysna, the sparkling sapphire Knysna Lagoon and all the way to the majestic Knysna Heads and beyond. The spacious en-suite bathroom has a separate shower and an elevated, oversized bath which shares the suite’s splendid vistas. Named for the beautiful birds that frequent Kanonkop’s tranquil garden the Sunbird Suite on the middle floor is light and airy and opens onto the garden on one side and has unhindered views of the forest and lagoon on the other. There is no better place to enjoy an early morning coffee or to watch the setting sun the private balcony with its glass balustrades providing uninterrupted scenes across the lagoon. The suite’s muted sandalwood colour scheme is accented with luxurious silver and gold silk throws and cushions, mimicking the iridescent colours found on the Knysna sunbirds wings. The en-suite bathroom comes with a separate bath and shower and many fine amenities to ensure a pleasure stay. Aptly named as it spans the lower level and is set in the indigenous forest, The Forest Room is a testament to luxury, opulence and wide open spaces. Jewelled tones of fern and moss greens, chocolate browns and antique dark wood furnishings bring the forest indoors. 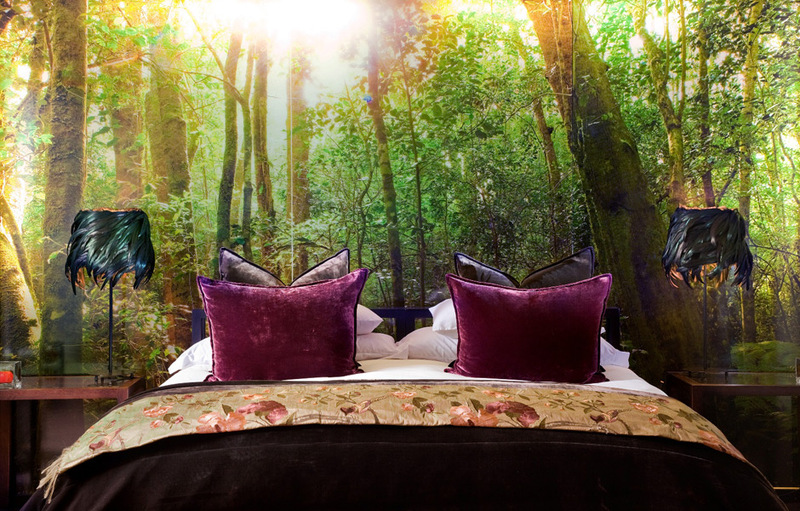 The lavish King-sized bed rests up against a giant softly lit forest scene. A large oval bath takes centre stage in the impressive Italian en-suite bathroom with its quartz pebble floor which has warm under-floor heating in winter. The oversized shower gives a gorgeous rainforest experience. The room opens out onto a private deck where guests can connect with the forest and enjoy the melodic birdsong. These adjacent suites share an airy light-hearted appeal. Beach hues of sandalwood and an eclectic range of sea blues are complemented by beautiful Persian rugs and dark antique furnishings. The en-suite bathrooms are spacious and include a bath and separate shower. These suites are perfect for lazy days and open out through gorgeous dark-wood folding shutter- doors onto a sun-drenched wooden deck overlooking the pool and surrounding lush gardens. Each suite has a comfortable reading are with two-seater sofa, armchair and coffee table with magazines and books. These rooms also have their own coffee and tea station. 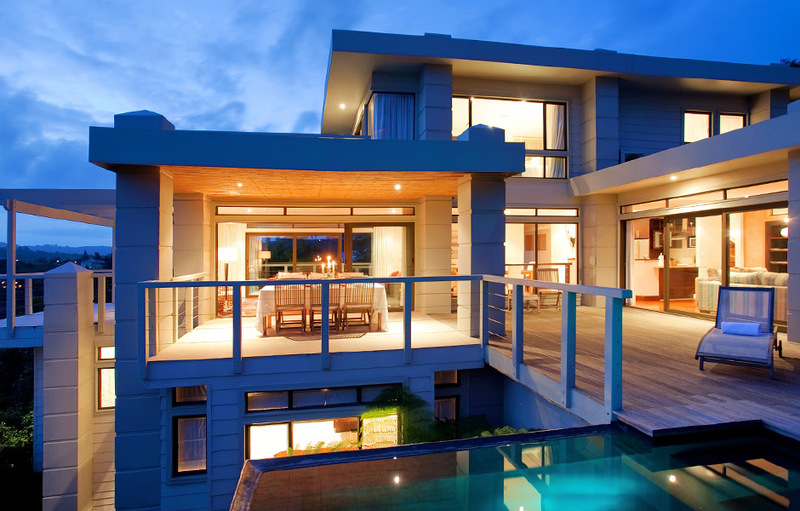 Knysna House Villa’s architects worked their magic to ensure spectacular views from every vantage point in the home. Stunning picture windows reveal all the natural splendour that Knysna has to offer to visitors to this magnificent corner of the world. 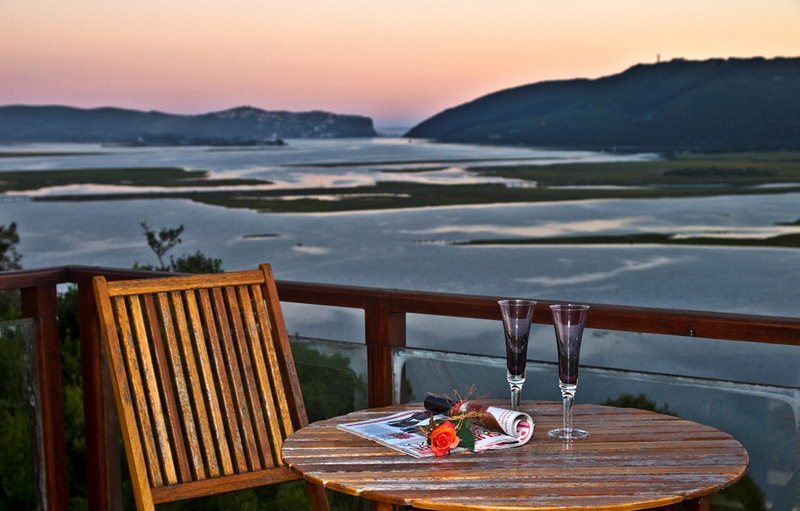 The Villa is the perfect home base to families or groups of friends who want to stay in Knysna. Each of the three spacious bedrooms is fitted with king-size beds with an option of single bed conversion if needed. The bedrooms also have their own private luxurious en-suite bathrooms. The upstairs Master Suite has a reading corner and a private balcony with panoramic views of the forest and lagoon. The two downstairs bedrooms are set within the forest canopy with large picture windows giving guests close-up views of the trees and birdlife. The Villa’s open-plan livings areas are on the home’s middle level. The ultra-modern kitchen is fully equipped with state of the art appliances including electric oven and hob, microwave, fridge and dishwasher. On arrival you will find the fridge stocked with refreshingly cool wine, beer and soft drinks. The dining room with an eight-seater table, extends into the spacious lounge and then out through double glass doors onto one of the large decks surrounding the villa. There is an additional lounge perfect for relaxing and watching a DVD or satellite television on the large plasma screen. The Villa has a fully integrated music system throughout. The Villa is fully serviced and guests enjoy a full breakfast prepared and served each morning. If you would prefer, the Villa can be booked on a self-catering basis.